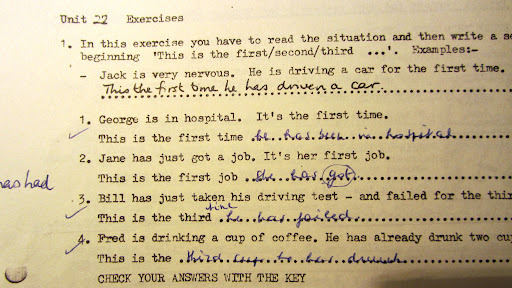 I actually remember the first time I saw a copy of Raymond Murphy’s English Grammar in Use. I hadn’t been teaching long and I was sitting on a bus in Brasília, going from one class to another, when I spotted it. “Sounds like the kind of book I need to read” I joked half seriously to myself. I really got an idea of the books success when I moved to Korea and saw the same piles of copies in book shops, just as I’d seen in Brazil, and I thought to myself “Man alive, I don’t know who this Raymond Murphy fellow is but I think he hit the jackpot.” Until recently, I still had no idea who he was. 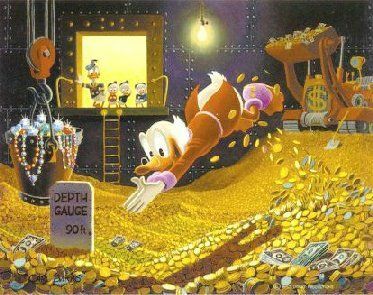 In my mind, he was a recluse, living in a solid gold house on a tiny Pacific island, surrounded by pots of cash, a bit like this. Someone who has an altogether more well rounded idea about him is Mieke Kenis, known to most of you as @mkofab on Twitter. She had the pleasure of being his student 30 years ago and of being a guinea pig for what was to become the world’s English language grammar bible. That rich English prose of Waugh, read by Irons, is sheer beauty turned into sound and it can still move me after 31 years as it moved the 24 year old me in 1981. The beginning of the series is set in Oxford and the city attracted me enormously. I had just finished my first full school year as a teacher but I knew there was still so much English to learn so although I was getting married in August I was determined to do a summer course first. Of course it had to be in Oxford and so in July 1982 I travelled to England to spend three weeks at the Swan School of English. 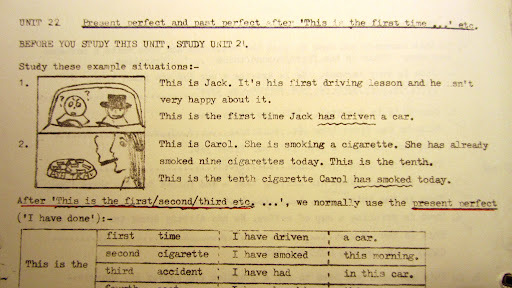 An early prototype of what was to become the most popular ELT grammar book in the world. I entered a world that is so familiar to many of you but that was exotic and exciting to me: an English language school. I had never seen a school building that was in fact “a house”. An intricate layout of floors, rooms and staircases, wall to wall carpets and a garden! Whiteboards, desks put in a U shape, tea breaks and a social programme of pub crawls (new word for me!) and coach trips during the weekends. Stratford-upon-Avon: Yay! I had booked a room in a university college building so that meant a lot of time on my own in the evenings and during weekends. Studying, reading, listening to the radio. A dream holiday in the city of dreaming spires. On the first day of the course we had to do a placement test and I ended up in Mr Murphy’s class. Mr Murphy, Ray, was a gentle, soft-spoken and very friendly man, who welcomed us every morning while music was playing in his classroom (I loved that!). The days were full of surprises as I had no idea what to expect. We learnt new words, did some intonation exercises, he taught us idioms and phrasal verbs, we did role plays and had discussions, listened to news broadcasts and wrote about the topics we had discussed in class. He corrected our work and gave feedback. I will be forever grateful for his lessons, for his grammar book(s) and for introducing me to Michael Swan’s Practical English Usage, which was exactly what I needed and which I still recommend to my students today. I would like to conclude by some thoughts on textbooks and on grammar. As a non-native speaker of English, and therefore still a learner, I am really thankful for textbooks. Not everyone has the privilege to be taught by a good teacher when and as often as they would like. Over the years I have learnt a lot from various excellent textbooks. I can only thank the many authors, like Raymond Murphy, who have written some great (self-study) materials for us, millions of learners of English. And then there is grammar. Of course we should concentrate on communication and we have come a long way since the days of grammar- based courses but I hope that native speaker teachers who call their courses learner-centered will let the learner decide on this too. If we, learners, want accuracy, please don’t deny us accuracy. Allow us, learners, to decide how accurate we want to be or how much like a native speaker we want to sound and how much British / American culture we want to learn. In 2004 I attended the IATEFL conference in Liverpool with a colleague. During one of the busy coffee breaks, plastic cup in one hand, heavy conference brochure in the other hand, trying to figure out where the next session would take place, I saw a man come in my direction. He had recognised me, he said. One look at his gentle face and I started stuttering that indeed I had been in his class in Oxford that summer of 1982. Thanks to Mieke for her lovely account of meeting Raymond Murphy and from her description I think you can get a sense of why his book went on to be so popular. Many thanks to Mieke for sharing her story with us. Make sure you follow her on Twitter at https://twitter.com/mkofab. After reading this article, Raymond Murphy was kind enough to get in touch with Mieke and thank her for the article. Thanks to Ian Cook (@idc74) at Cambridge University Press for passing it on to him. Love the story n connections. Nice to read a Mieke post too! What a great read! Both of you describe the setting, the book and the teacher in such a vivid way. None of it is familiar to me – here we use our local text books with our very own “stars” and I have not encountered the book. Mieke's description of the language school was fascinating as I haven't experienced that either! Always makes one feel good to read about an awesome teacher – they deserve the credit! “Of course we should concentrate on communication and we have come a long way since the days of grammar- based courses but I hope that native speaker teachers who call their courses learner-centered will let the learner decide on this too. It's funny how often we talk about learner-centeredness and yet fail to realise that, by making the decision that communication is far more important that accuracy we're denying learners the power of choice and starting from a very teacher-centered perspective. What if learner do want to sound as close to native speakers after all? This going to sound absolutely terrible … but a lot of the time (not all of the time) learners don't know enough about the subject to make useful choices for themselves. Yep, that does sound absolutely terrible. “Teacher knows best” in your class eh? Sorry, but it doesn't sound that terrible – it was pretty carefully hedged, after all. There are * a lot * of false assumptions about language and language learning around, and anyone can be taken in by them. Thank you, Brad and Naomi, for your kind words. The fact that the book is not known at all in some parts of the world shows how diverse the world of EFL is. We assume that EFL teaching will be more or less the same everywhere but there are still a lot of local, cultural or just practical issues that play an important role in the choices that EFL teachers(can) make. I like to believe that books, methodologies, approaches or teaching styles all have their own value as long as a teacher can inspire and motivate learners. Thanks for your comment, Henrick. My point was indeed that although communication is the most important thing, some learners might want to be as accurate as possible too. I think that people who are interested in language, find that important, also in their native language but that is indeed a choice that every learner/speaker has to make for themselves to a certain extent. How do we measure language proficiency after all? Is it just a wider vocabulary, more idiomatic use of the language, mastering more registers, a more native-like accent? For me it is all of these but definitely also accuracy. Hi Henrick and Mieke. I just wanted to comment on the perception that you have about native teachers and students needs. I think that most teachers that are here in our PLN and talk, tweet and blog about leaner centred-ness, fluency over accuracy, respecting different accents and so on, are coming from the right place. The distinction is between teachers who DECIDE that this is what the students need rather than BELIEVE that this is what they need. If a student wants to be very accurate and focus on only on writing, say, then that's fine with me because it's their choice and it's not being imposed by me and my beliefs. I'm not sure it's the best way, and I'd advise them of this, but ultimately they are paying me for a service and I will deliver it (don't get me wrong, I wouldn't teach anything to anyone and if I didn't want to do it I would tell them to find another teacher). As Scott Thornbury said in the iTDi error correction webinar, if your students are air traffic controllers then accuracy is very important. What we have to do as teachers is respond to the situation as we see it, and the reality is that most people that I teach need fluency far more than they need accuracy. Give me enough time with them and they'll get both! I love what you say about textbooks and how fortunate people are to have them when they are learning a language. And what you say about accuracy – amazing! And in the picture, I think I have found you in the right side of the photo, in a dark blue shirt, right? Is Professor Murphy in the pink shirt? As to the picture: the clue was blue. 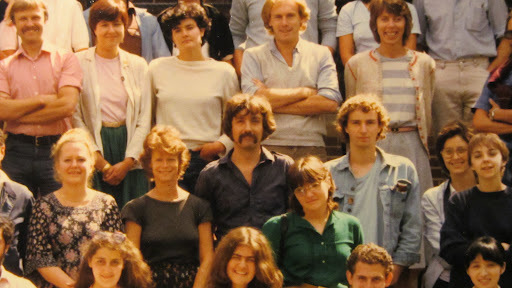 I am indeed the one with her eyes closed – I am not good at being in pictures – and Mr Murphy is the one in the middle with the dark blue shirt. Just behind me was one of my classmates, a teacher from… Greece. Writing this story was a great trip down memory lane and it ended in a way I could never have expected. So, thanks again, James, for inviting me as your guest here. This is interesting. Yes, the best-selling grammar textbook, as they say. Yet I wonder what he's doing now and if he's written any books recently? Does he still teach? I loved the part about the teacher still recognizing the student after more than 2 decades? Wow..